Recapturing of Baiji was a major victory for ISIL after a string loses in recent weeks. 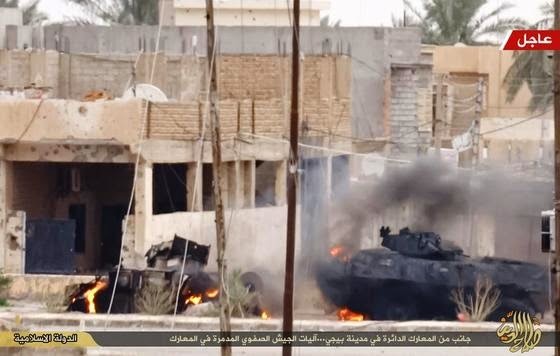 Before retaking Baiji, however, ISIL also took control of some towns near Samarra. The Iraqi military and Shia militias had ejected ISIL from Jurf al-Sakhar, Amirli and Jalula, and the Peshmerga had retaken several northern towns. On Thursday, the Peshmerga, backed by U.S.-led coalition airstrikes, retook large swath of territory between Kurdish autonomous region and Sinjar, and are poised to retake the city of Sinjar in the next few days. Meantime, the Pentagon said hundreds of U.S. troops are now deployed in the restive Anbar province. About 350 troops are stationed at Al Asad Air Base. The force is composed of advisors and support personnel, as well as a force protection contingent, Stars and Stripes reported on Thursday. The troops on the ground are helping the Iraqi Army’s 7th Division, stationed in Anbar, with developing strategies, mission planning and coordinating close air support operations.